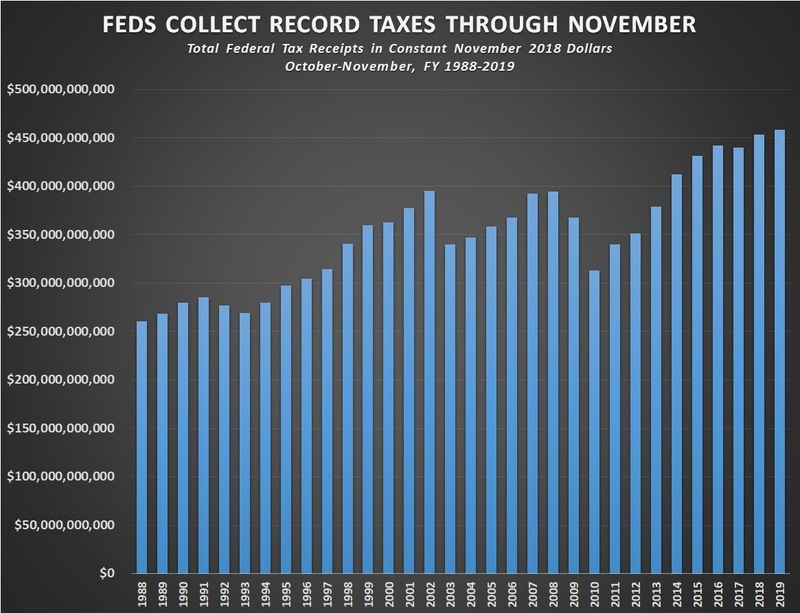 (CNSNews.com) - The federal government collected record total tax revenues of $458,653,000,000 in October and November, the first two months of fiscal 2019, according to the Monthly Treasury Statement released today. Even with these record tax collections, however, the government still ran a deficit of $305,394,000,000 for the first two months of the fiscal year. That is because while collecting a record $458,653,000,000 in taxes, the government spent $764,046,000,000. 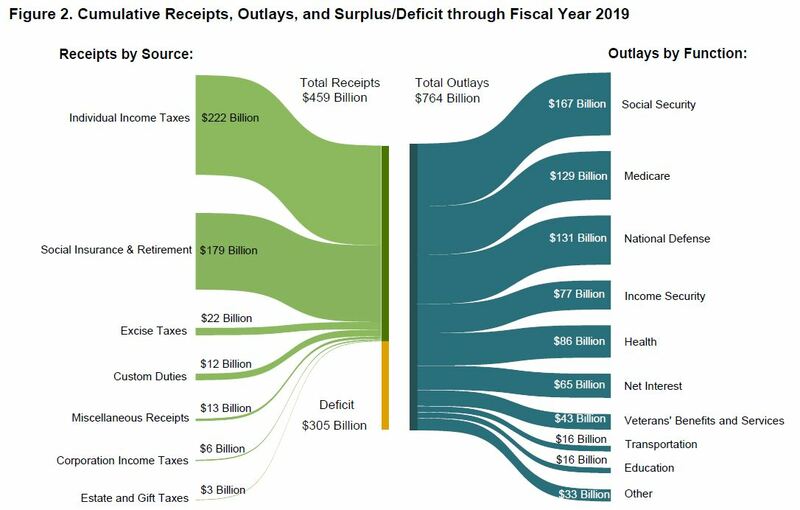 The record $458,653,000,000 in federal taxes in October and November of fiscal 2019 was up $5,280,090,000 from the $453,372,910,000 in total taxes (in constant November 2018 dollars) that the federal government collected in October and November of fiscal 2018. Although the total federal taxes collected in October and November set a record, individual income tax collections did not set a record. In October and November of last year, the federal government collected $231,465,760,000 in individual income taxes (in constant November 2018 dollars). In October and November of this year, the federal government collected $222,237,000,000 in individual income taxes—a decline of $9,228,760,000 from the same period last year. Corporation income taxes, Social Security payroll taxes, excise taxes, and customs duties all increased in October and November of fiscal 2019 compared to October and November of fiscal 2018. In October and November of fiscal 2019, the Treasury collected $6,354,000,000 in corporation income taxes compared to $1,456,200,000 (in constant November 2018 dollars) collected in October and November of fiscal 2018. That is an increase of $4,897,800,000. It is also despite the fact that in November of this year alone, the Treasury collected -$1,646,000,000 in corporation income taxes. In October of this year, however, the Treasury collected $8,000,000,000 in corporation income taxes. In October and November of this year, the Treasury also collected $11,835,000,000 in customs duties. In October and November of last year, it collected only $6,478,000,000 (in constant November 2018 dollars) in customs duties. That means that from the October-November period last year to the October-November period this year, customs duties are up $5,357,000,000—or 82.7 percent.